Non enveloped, large (45-50 nm diameter) icosahedral particles composed of 420 subunits with a T=7 symmetry. The virion shell is multi-layered. 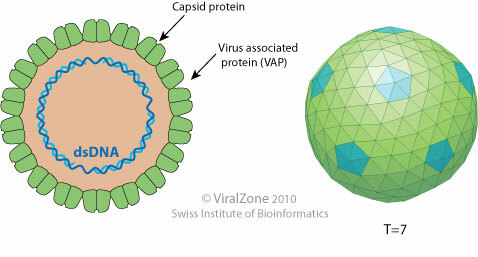 It has not been described whether handedness of capsid is laevo or dextro, here the pictures dsplays a laevo form. TRANSMISSION Virus not transmitted by mechanical inoculation; transmitted by grafting.